The Arc’teryx Norvan is the archetypal fast and light product; 200g of waterproofing with the iconic Arc’teryx build quality and design. Using GoreTex C-Knit the Norvan keeps rain out while wicking internal moisture away from the body and does it with style. 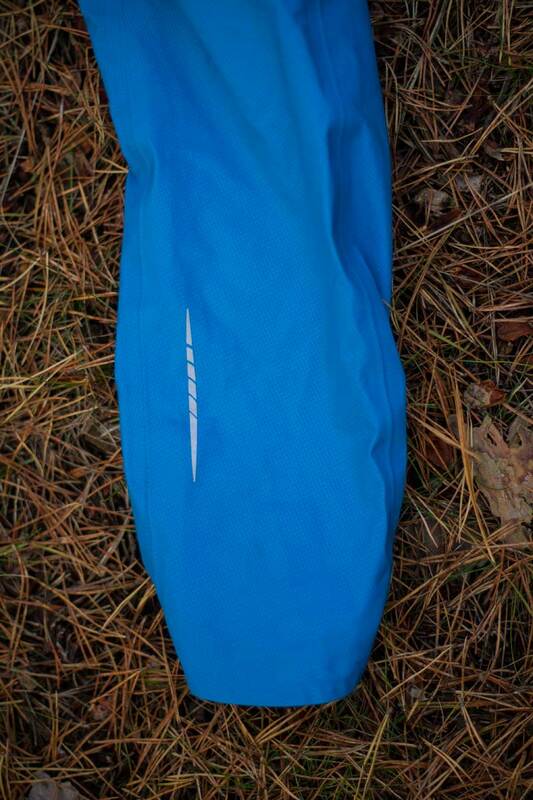 Soft and light it packs away easily into the smallest of spaces and it’s simple lines belies the attention to detail but when needed it offers the trail runner or fast moving athlete protection from the elements. The Norvan delivers comprehensive GORE-TEX® protection with a minimalist design fine tuned for mountain training, running or other high output sports in wet, windy weather. N20p 3L GORE-TEX® fabric with GORE® C-KNIT™ backer technology is exceptionally light, highly breathable, soft, supple and delivers durable waterproof breathable protection. 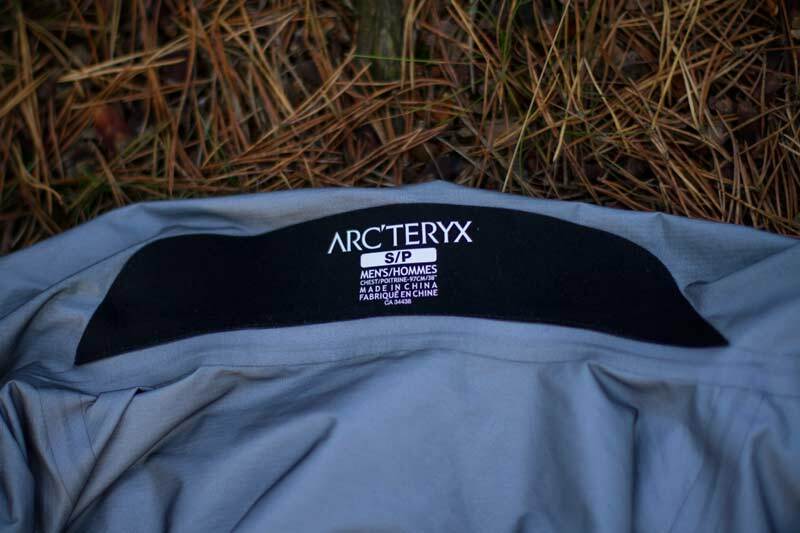 The Norvan uses the Arc’teryx Trim fit to help minimize extraneous fabric and keep the material close to the body to maximize its breathability. Articulation in the arms and gussets under the arms elevate mobility and comfort. The top of the cuff is shaped to extend its coverage, and the elasticized bottom hem seals out drafts. 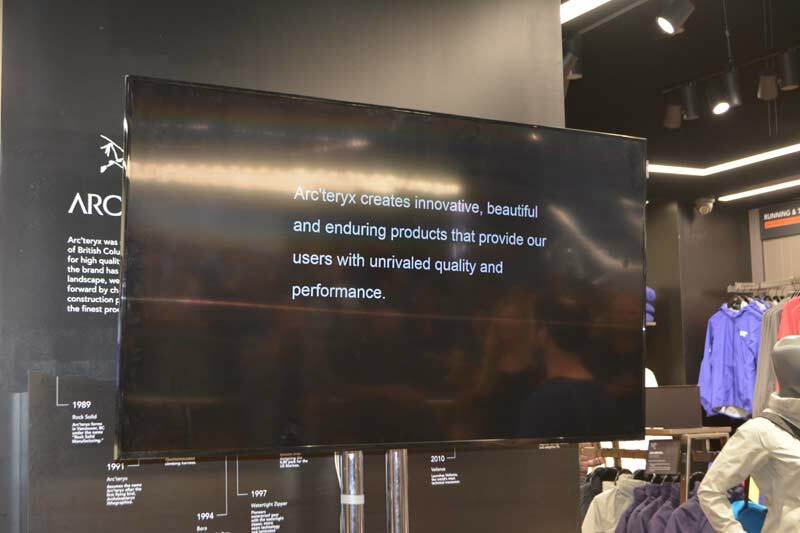 I was invited down to the opening of Arc’teryx’s Flagship European Store in Piccadilly a week before we flew out to Chamonix. The double story store is immense. Nowhere else can you see the full range, along with learn about the brands history and reasoning behind decision making. Other than having a good mooch around isles of tech clothing, we were able to meet designers and athletes, to gain a more in depth understanding of the brand. Two things that stood out for me were the lines “Timeless design” and “we would rather you bought your next item to compliment, rather than replace” First off, if you compare an Arc’teryx jacket from 10 years ago to that of 2015, little has changed aesthetically. Yes the materials and construction may have evolved, but the older model doesn’t look dated, out of place or like someone else designed it. That takes a lot of forethought, planning and commitment. Think Porsche with cars. Secondly, buying to compliment. What’s the point of splashing £300 on a hardshell that needs replacing in a year or two. For sure, you will need to reproof the GORE-TEX™, but the jacket itself is built to last. Too often we are quick to ditch a perfectly fine piece of running clothing when it doesn’t look on trend or sponsored athletes aren’t dressed any longer in it. Buying to complement, gets the most out of the product, saves you money in the long term and has an environmental benefit. As the saying goes, buy well, buy once. 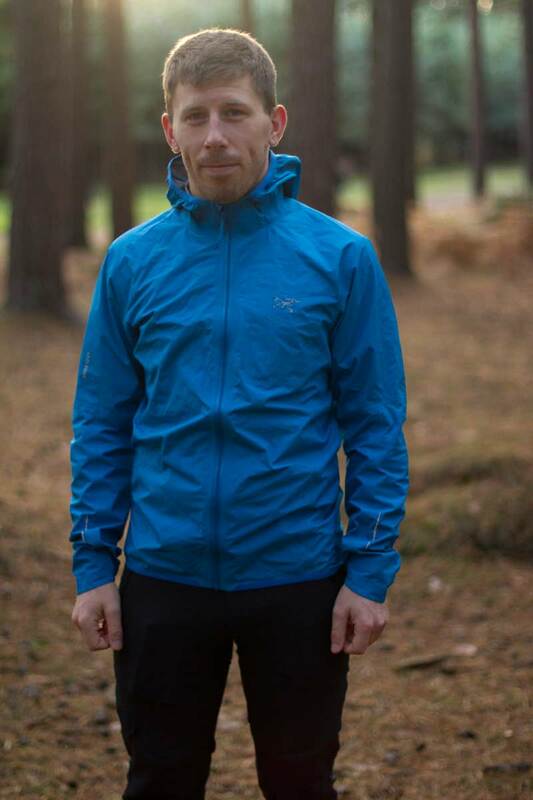 The Norvan is Arc’teryx’s lightweight, 3 layer hardshell from their Endorphine running range. Developed to keep you protected when the winds and rain are howling, unlike many, this is a full 3 layer membrane jacket. Constructed from GORE-TEX™ 3 layer fabric with GORE™ C-KNIT backer technology, it feels much softer and supple than you would expect. 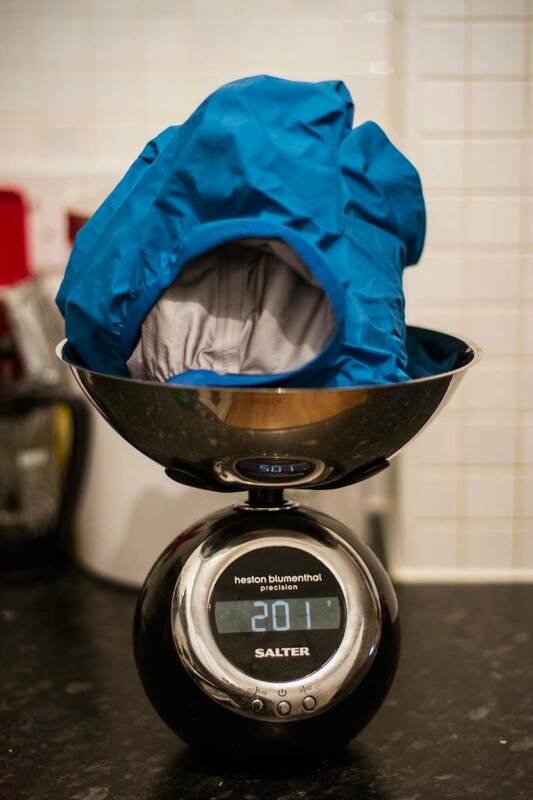 Equally it is far more packable than a standard 3 layer jacket. C-KNIT is a dense, extremely thin circular knit that is added as a backer to the GORE-TEX™ membrane. The result is a supple, less bulky, durable laminate that is more breathable and lighter weight than previous versions. But wait there is more. The circular knit’s construction is soft and smooth to the skin, quiet and reduces the likely hood of snagging when putting it over another layer. In short is allows for a more durable and protective membrane to be added without the normal weight and comfort penalties associated with them. 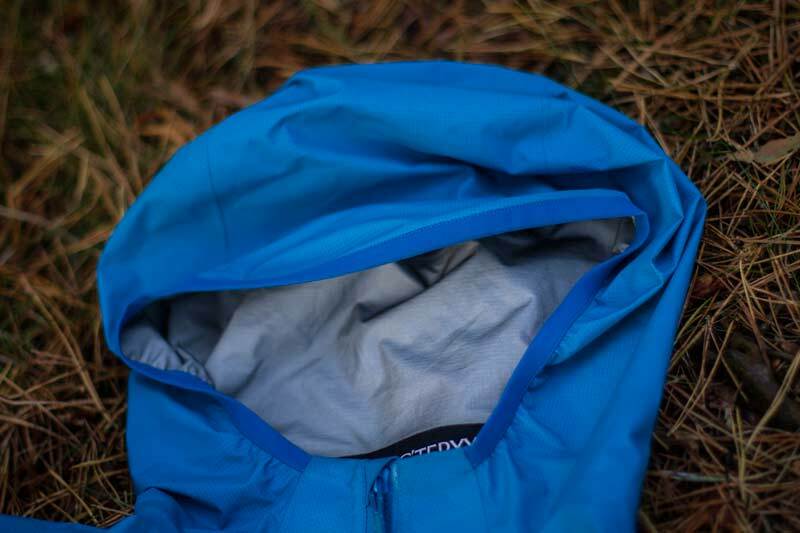 The outer fabric is tough enough to deal with rocks, hedgerows and those pesky branches you thought you’d missed, but it isn’t like wearing a suit of armour and offers no restrictions. Against the skin the GORE™ C-KNIT is soft, having none of the clammy stickiness a PU or light backer often may have. I was happy to throw this on over a t-shirt, it wasn’t uncomfortable and when wet didn’t grip my arm like cling film or a vacuum bag with the air all sucked out. Given the aim is to be more breathable, there was definitely a lack of moisture at the end of a run. Now, I do sweat like a pig roasting in the midday sun, whether in the depths of winter or on a clear night, but the GORE™ C-KNIT definitely helped transfer a volume of this excess moisture away. The GORE-TEX™ 3 layer membrane offers great protection. When in Chamonix when the heavens opened and I was stuck in my tent needing to dash to the gents, it kept everything at bay. Hardly a test I know. So when running around the local trails with the running club (and it has been howling on several occasions), I was able to stay protected and not over heat despite it being a mild October. It also saved me from the high winds up on Aiguille Du Midi on my final day in Chamonix, when temperatures dropped to -9 and I was woefully unprepared, with my kit being in my hold bag. I got sunburnt the a few days previously! 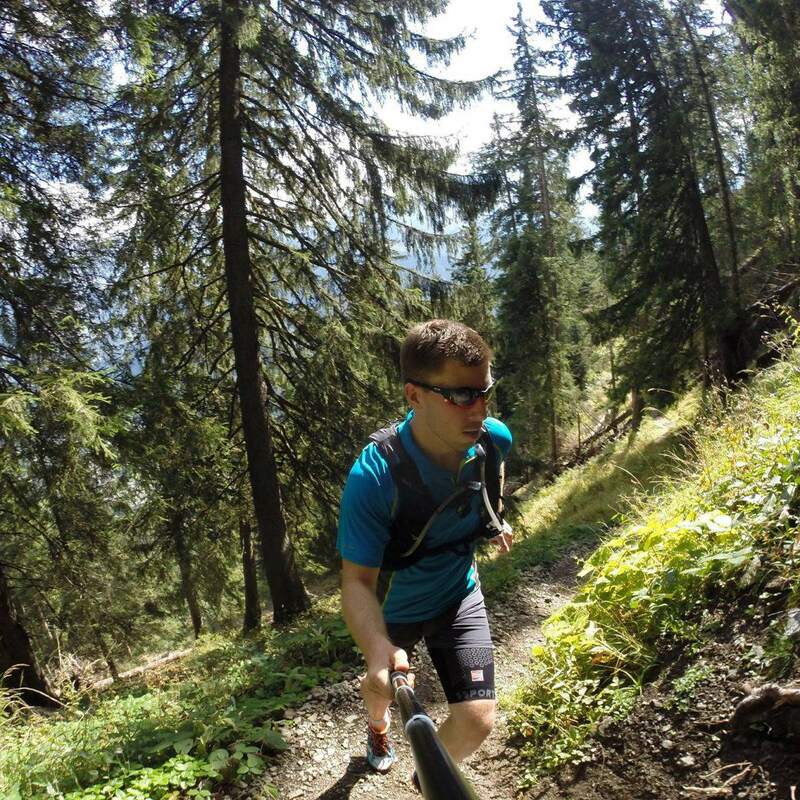 Above all else, I was able to stick it in my pack whether running up the VK course, taking on a 1000 meter 12 mile run to a Refuge or on my way commuting by bike in the valley. So. The tech does the job is sets out to and I dare say it will get tested further this winter as the UK does it’s best to make everyone moan about our wet and windy dark nights. 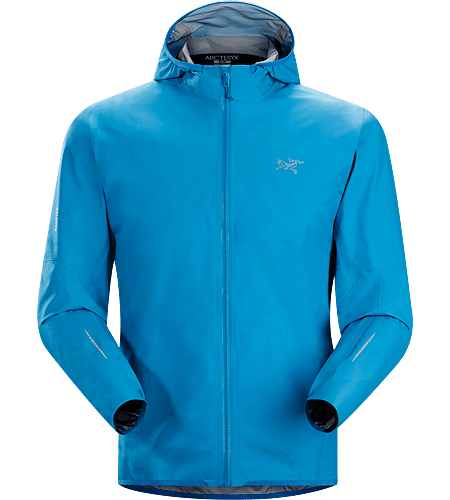 The jacket incorporates Arc’teryx’s Trim Fit. It is athletic and there is no excess material flapping around in even the most severe of gales. Contoured to the body, you can fit a small insulated layer underneath, but this is definitely a jacket to worn on the move, rather than manning a checkpoint. I opted for a small, being all of 5ft 7” and I am happy to report it fits well. The arms are the correct length (I often have arms that extend over my hands) and the body and shoulders are non restrictive, yet aren’t too roomy. If you are looking at purchasing the Norvan, I would recommend trying it on beforehand as it suits a trimmer physiques and when splashing this sort of money, you want to know if fits perfectly. With a combination of a new lightweight fabric and a trim fit, you know the scales are going to be light. Well my uber hipster scales spat out a weight of 201 grams against the claimed 215 grams. For a 3 layer jacket, to paraphrase from a comedian “totally bonkers mental,” when considering the level of protection this provides. And it shows. I find myself time and again, even when popping out with my partner for a walk round the trails, I stick it in the bag if the weather merely hints at a chance of precipitation. 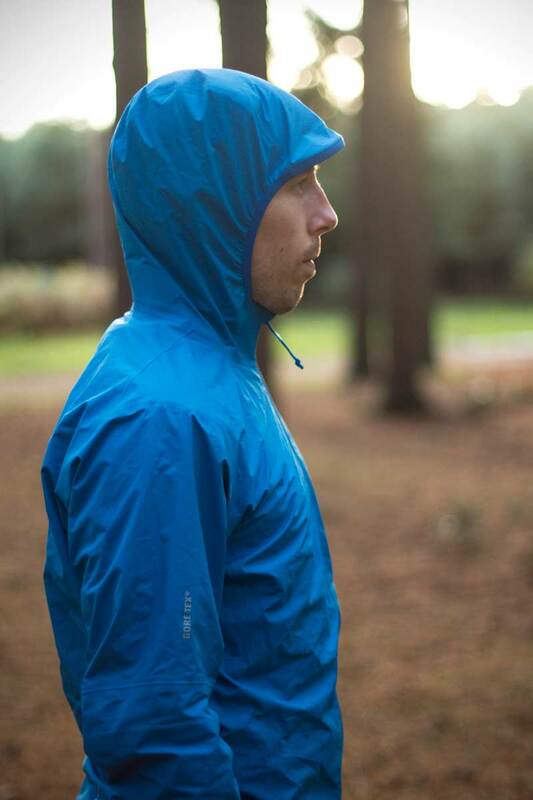 Light enough to stick in your race vest or pack for a trail or ultra race, strong enough to hold back the worst our British weather can throw at you. Storage is provided via an internal laminated pocket on the left hand breast. It is zipped and has a port to allow you to run a headphone wire through, without having to jam the teeth of the zipper on it. Now I know this isn’t a feature everyone will feel is needed, however with the number of people that prefer listening to music on the trail, this will make life that bit easier. It’s a little touch, but a good one. The cuffs have elasticated hems and there is no adjustability. I found them to be tight enough to get a good seal, and I wasn’t left wanting for tension, they do a good job sealing you in without feeling like you are wearing restraints. The top of the cuff is extended material, to provide your wrist extra coverage and more than anything I like the aesthetics. A full elastic cuff can cheapen the appearance of a high performance jacket, but the designers have managed to keep this hidden whilst improving the usability. Crafty. The hem of the main body is elasticated as well, providing no adjustability. Given the weather you will wear this through, this could be an issue, however the trim fit now comes into play. As the lower section is contouring your body, I find it locks onto your hips or if you’re like me, your large posterior and there are no issues of riding up. This is also a reason why the weight is so low. Add elasticated draw strings, more material, stitching and toggles, you immediately start increasing the grams. You can tell every detail has been thoroughly considered. Moving up, the arms are articulated and there are gussets underneath. Put the jacket on and you wont notice it. Job done. The arms don’t restrict and don’t add tension when bending or moving through dynamic scrambling movements. That’s enough to know that these features are working. If I was to write that I was finding my arm being constricted, it was riding up and down and running was a struggle, then you’d know these features weren’t living up to expectation. But they do. Under your stinky pits, you’ll find Venturi style permanent vents. Two either side. These are designed to pull air in, aiding temperature regulation when in motion. Taped on the inside, the way they have been designed negates the need for a zipper, saving further weight, bulk and to be honest making it look better. A jacket covered in a multitude of zips doesn’t win beauty points for me. On a windy day, you feel the air and it certainly is doing its job. My stone age way of seeing the real effects after a run and given my sweat levels, the GORE™ C-KNIT didn’t smell like it was rotting through my personal stench. It will be interesting to see how effective these are during the winter, as the last thing you may want at times is sub zero air being blasted into the jacket. Now the zip. I know you have all been on tenterhooks to hear about this most simple of devices. Most jackets have them, but if it doesn’t work, it can ruin a garment. 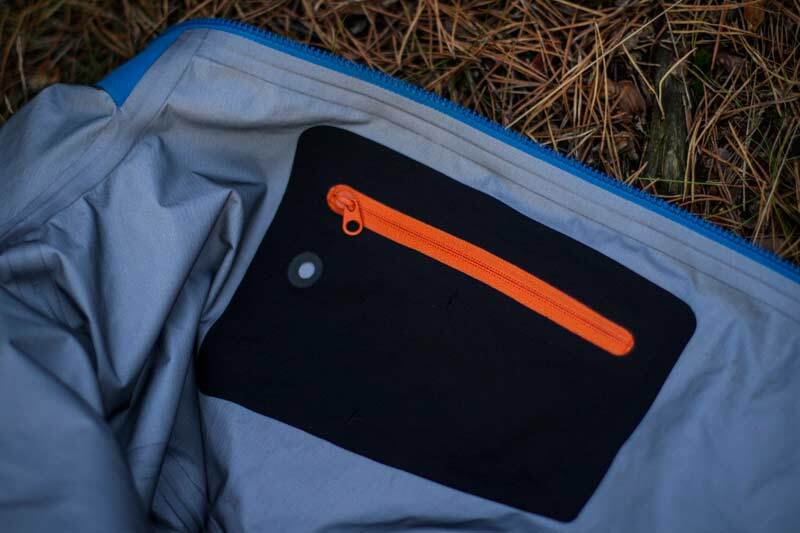 The WaterTight™ zipper has an easy pull and works. A rear storm flap provides additional protection and a top collar prevents irritation against the chin. The hood. Often this is love or hate for me. I have a big head and there are no two ways about it. I may be short, but I fit a large helmet and non adjustable hoods can cause me issues. The fitted hood on the Norvan is for me the best I have tried to date. It is secure, comfortable and has several small features which add up to making it pleasant to wear. The outer edge is elasticated, ensuring it keeps a low profile and vitally stays shut. But more than that, the brim has some structure, not with an internal wire, but it has a natural peak which aids keeping rain and secondary drips out of the eyes. 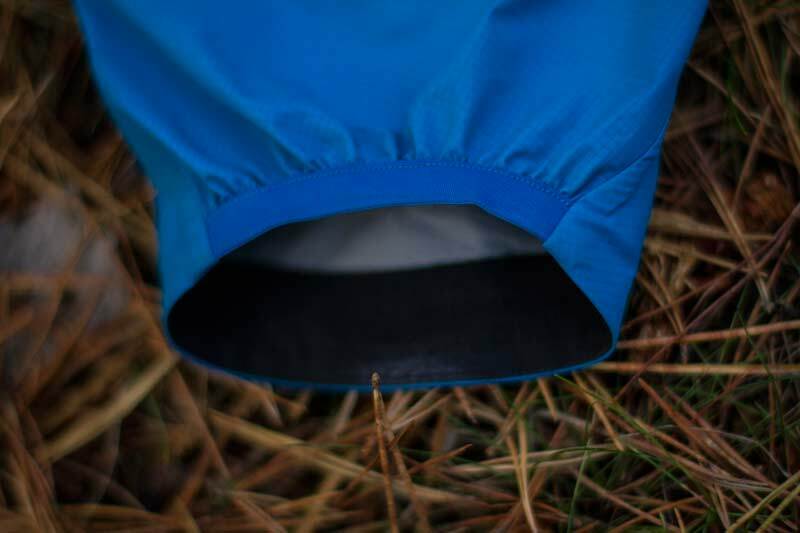 The hood itself is designed to sit under the chin, which in non windy/milder conditions is perfect. If I was to take this into the highlands of Scotland or Scandinavia, I would prefer a little extra material around this area to protect both my extremity and seal the jacket from the cold. The rear of the collar has a reinforced backer, which draws the bottom in reducing the potential for drafts. 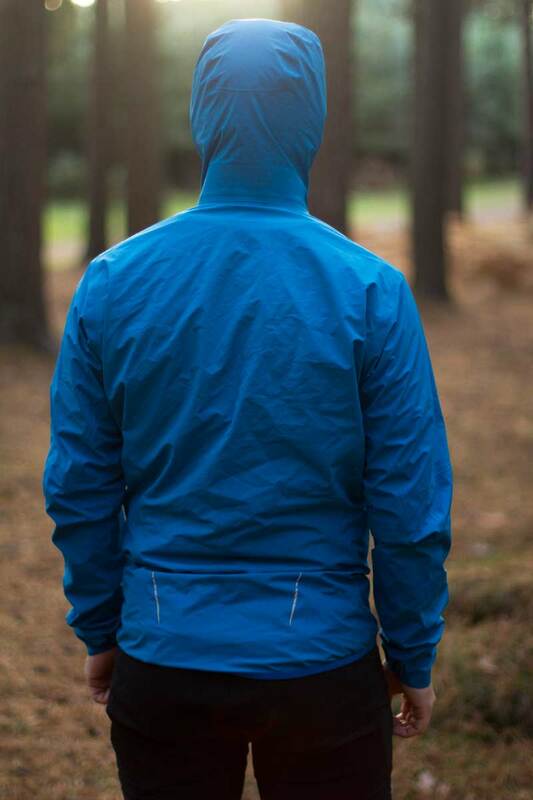 But more than that, when the hood is down it provides the collar with structure and after running in the rain and wind with it down, it is more like running with a traditional hoodless running jacket. That for me, has to be one of the best features, whether intended or not (I’ve checked all the information you receive as a reviewer and haven’t found it mentioned). It is those extra details which make this jacket something special. 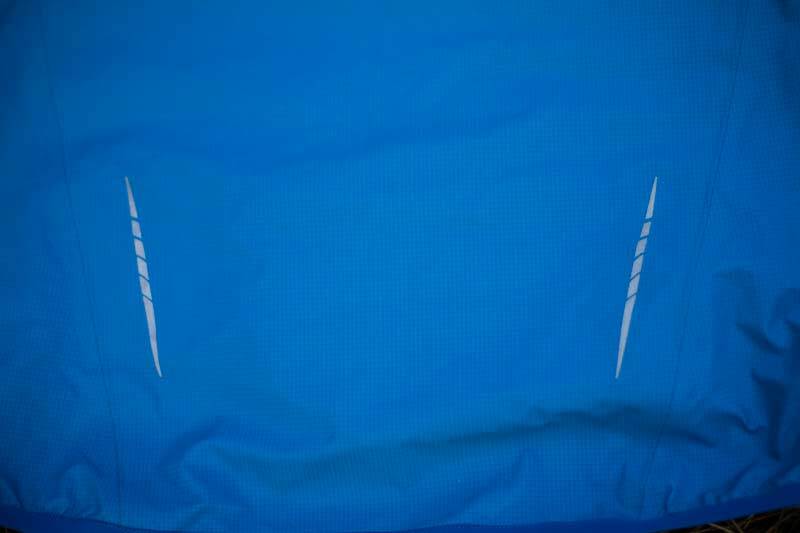 For visibility, there are two reflective strips on the lower back and one on either arm. They are subtle and unobtrusive during the day. Above all else, the Arc’teryx Norvan is a lightweight running hardshell designed to offer the wearer a new level of waterproof protection. 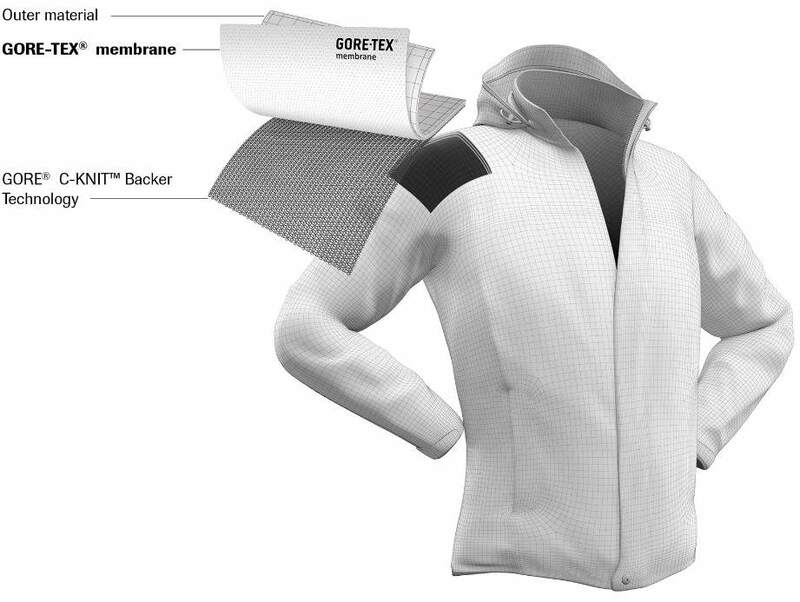 A full 3 layer GORE-TEX™ jacket, combined with GORE™ C-KNIT backer for improved breathability and comfort. I still struggle to believe it is a 3 layer, given how packable and light it is. For a stripped back jacket offering this much protection, combined with the technical detailing, I have struggled to find flaws. All I find myself doing is saying I wish it had X or Y, which goes against why it has been developed. Of all the kit I have been sent in the last few months, this has caused the most jealously within the test team. Yes it is expensive, it is very expensive. Is sits above and beyond the competition in price, but it is also offering membranes and backers they aren’t. I started off the review by saying Arc’teryx would rather you bought another item to compliment your existing purchase, rather than replace it. I think that rings true with the Norvan, it’s going to take an awful lot to retire it.